Remember as a kid, the excitement that Easter brought? The feverous egg hunt and the wonderment surrounding the movements of the mysterious Easter bunny and the abundance of chocolate treats you would receive – to be devoured in increasingly record time year after year. As older, more mature, professional and responsible “adults” …well that excitement just never quite seems to leave us does it? And why should it. There’s just something about Easter - it’s religious and cultural significance – and the giving and receiving of gifts that rekindles a child-like glee in people young and old. With just a few short weeks to go, don’t miss the opportunity to set hares running in the offices of your treasured clients, business partners and staff. adgiftsonline has more than 50 original and creative ways to help you celebrate Easter – and put a smile on everyone’s face. Our promotional Easter chocolates and sweets come complete with your branding in striking full-colour and make an eggstraordinary lasting impression. We have a huge range of Easter themed corporate gifts – from the ever-popular Lindt bunnies, printed Easter egg boxes, speckled mini Easter egg pots and more. Time’s running out for a cracking Easter – so hop to it! Call the adgiftsonline team today on 01782 571950 for a pun-free personalised recommendation and super-fast turnaround – no yolking around! A 100g foiled hollow Belgian milk chocolate Easter Egg in a digitally printed box, fully branded with your artwork or alternatively choose from one of our stock designs. 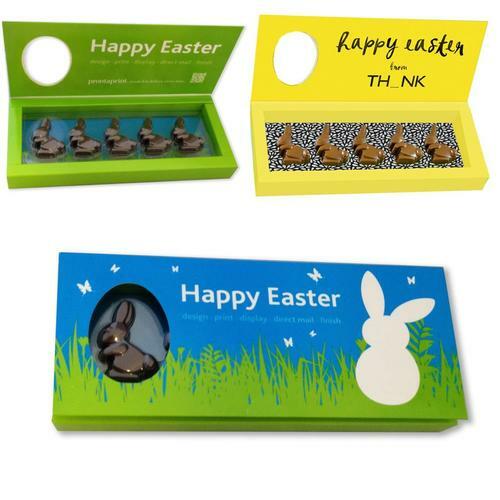 Our boxes of promotional chocolate Easter bunnies are fully customisable to suit your company's image, chocolate bunnies come in a high gloss box with an egg shaped window to one side. 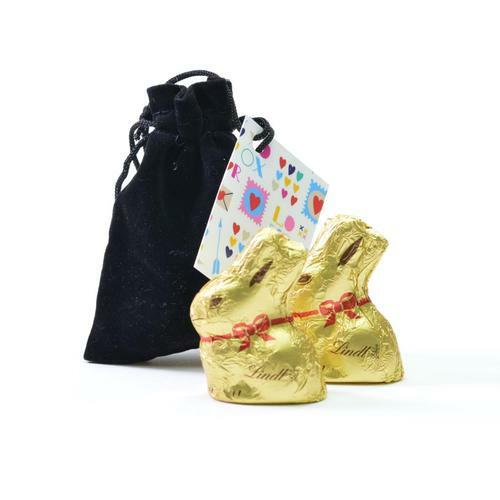 Velvet drawstring bag filled with 2 10g Lindt chocolate bunnies. Pouch available in red, black, blue or purple. 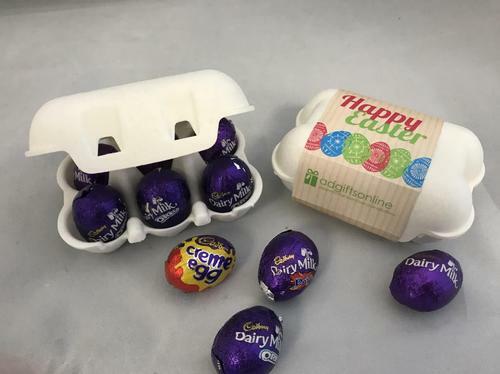 Eco friendly quail egg boxes ideal for your Easter chocolate gift filled with 6 Cadbury's chocolate eggs. See the full Easter 2019 range here. Mouth too full to answer! !